Current status  The plantation is now part of the Old Santee Canal Park. The house is open for tours. 1678  Earliest known date of existence (2). Sir Peter Colleton received a land grant of 12,000 acres. The property became known as the Fairlawn Barony (2). 1700s  Stony Landing was an important to the transport of supplies for the colonists. Supplies were carried up the Cooper River then off-loaded at Stony Landing where they were then taken westward via the Cherokee Path. Conversely, rice planters of northern Berkeley County brought their crop to Stony Landing for transportation down the river to Charleston (1).
?  Sir John Colleton IV and wife Anne Fulford inherited the Stony Landing land (2). 1777  Colleton died and Stony Landing went to his daughter Louisa Carolina Colleton Graves (2).
?  Louisa's son Samuel Colleton Graves was the next owner (2). 1823  Graves died and his widow retained the property (2). 1839  John H. Dawson purchased the 2,319 acres called Stone Landing from the Graves estate (1 and 2).
?  The Confederate semi-submersible torpedo boat, the Little David, was designed by Dr. Ravenel and constructed at the plantation (1). 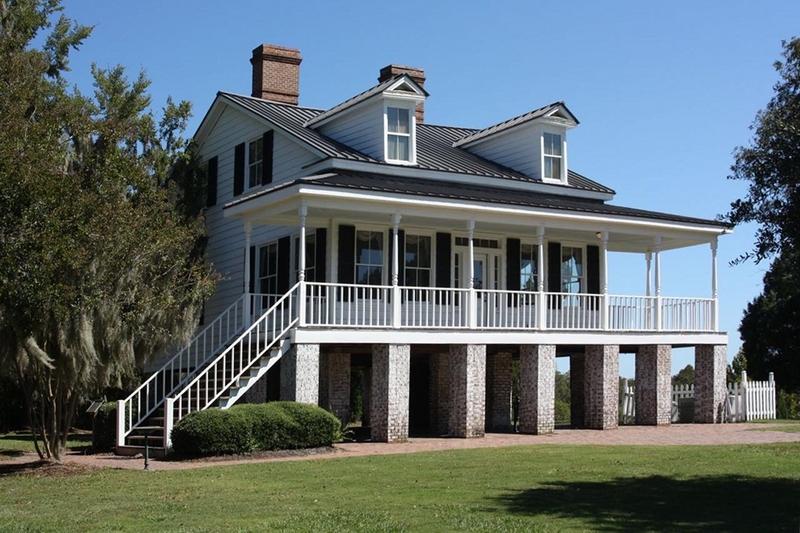 1910  Sen. Edward James Dennis, Jr. purchased the plantation for use as a winter home (2). 1989  The Old Santee Canal Park opened (1). The house is constructed with hand-hewn timbers. It has been restored including period reproduction furniture and is open for tours (1).